NASHVILLE, Tenn. -- If a "Dream Team" that met early this month has its way, funds from the $7 million Young Clergy Initiative will be used to support innovative projects of all sizes that could create “seismic change” by attracting young people to pulpits in The United Methodist Church. And prayer will be a big part of the process for anyone who gets the funds. That was the word from the Dream Team, a group of 12 young clergy, campus ministers, pastors, youth ministers, annual conference and seminary staff who met Sept. 5 and 6 in Nashville. Team members pooled their expertise in young clergy issues to produce a timeline, priorities for the grants and funding category recommendations. "Dream Team" meets in Nashville to draft plans for use of Young Clergy Initiative funding approved by the 2012 General Conference. 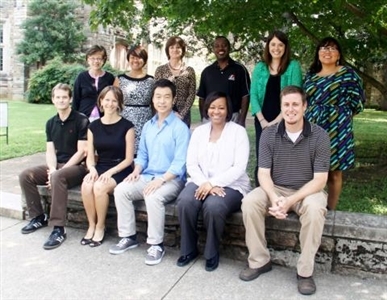 From left, front, are Trip Lowery, Beth Ludlum, Sam Kim, Shonda Jones, Brad Farrington. From left, back row, are Beth Downs, Sophia Agtarap, Melissa Wiginton, Qunicy Brown, Casey Langley, and Robin Minthorn. Not shown, Kenda Dean and Drew Dyson. Photo by Vicki Brown. The team's plans must be reviewed and approved or modified by the General Board of Higher Education and Ministry (GBHEM) Board of Directors on Sept. 23. The goal of the Young Clergy Initiative is to increase the number of young clergy in The UMC. “We want the money to be fruitful and effective,” said Rev. Trip Lowery, GBHEM’s director of Young Adult Ministry Discernment and Enlistment. One of the big pieces added to the grant application process was a suggestion from Casey Langley, youth ministry director at First UMC in Fort Worth, Texas. “What if there is some sort of requirement that those applying have to name people who are praying for this new ministry? That would make it less institutional,” Langley said. Quincy Brown, vice president for Spiritual Life and Church Relations at LaGrange (Ga.) College, agreed, as did the rest of the Dream Team. “What you are saying is spirit-filled,” Brown said. The team recommended grants be awarded in three categories: $5,000 to $20,000, $20,000 to $50,000 and $50,000 to $100,000. There was some discussion about whether $5,000 was too small a grant to make any kind of impact, but Rev. Beth Ludlum, GBHEM’s director of Student Faith and Leadership Formation, said she had seen students do great things with small amounts of money. Ludlum said she hopes to see grassroots proposals that result in partnerships. Rev. Melissa Wiginton, vice president for Education Beyond the Walls at Austin (Texas) Presbyterian Theological Seminary, said she had been struck by how many candidates for ordination in The UMC have had experience in ministry outside their local church during campus ministry, high school, or even earlier. Rev. Brad Farrington, campus minister at Appalachian State University in Boone, N.C., said the projects need to show young adults that ordained ministry is “worth your life,” in recognition of the fact that a clergy track means rejecting a potentially lucratrive secular career. "We have to really think big,” Farrington said. The initiative's funding was approved by General Conference last year to focus efforts on encouraging young adults who wish to respond to the call to ordained ministry in The UMC. Dream Team members agreed that if is spent for programs aimed at “preventing the death of an institution,” efforts will fail. Recommendations for the GBHEM board include a proposed timeline of grant applications being taken Oct. 1 to Feb. 1, with initial grants awarded and funds disbursed by March 15, 2014. GBHEM will monitor and evaluate funded projects from March 15 to Aug. 31, and grantees must report by September 2015 on the progress of their projects. The team also recommended that funds be distributed in two rounds, with a second deadline of June 1, 2014, for applications. to facilitate experiences connecting faith commitments and the needs of the world. The Dream Team conceded that some in the church expected the money to be spent on scholarships, but there was consensus among team members that spending money on scholarships would not lead to the real change the church needs to appeal to young people. The group suggested that students, young adults, annual conferences, boards of ordained ministry, campus ministries, colleges and seminaries were among those that might apply. “I think what we want to do is invest in places that are fertile ground,” said Rev. Shonda Jones, associate dean of Admission and Student Services at Wake Forest University in Winston-Salem, N.C.
-- Vicki Brown is associate editor and writer, Office of Interpretation, General Board of Higher Education and Ministry.